Plastering is the preferred process to turn rough building surfaces into smooth decorative areas. It is most commonly done on walls and ceilings. Plastering not only makes a surface look good, it also provides a layer of protection for structural integrity. Most buildings are built using blocks or bricks. When these materials are stacked on top of each other, there may be some irregular portions created. Smearing mortar over these irregular surfaces creates a clean, smooth finish. There are different types of plastering materials used in construction. These materials vary depending on the preference or desired effect. Lime-based plaster. This plaster is a mixture of sand and lime in a ratio of 1:3 according to volume. Lime plaster is used for both the basecoat and finishing coat. If used as undercoat or basecoat, you will need to add another layer of multi-finish plaster on top to create a high-quality smooth surface. Gypsum plaster. This type of plastering material is one of the most widely used. It can be used as the basecoat or finish coat. Manufacturers of plaster material use gypsum in a variety of products such as Thistle Hardwall and Thistle Board Finish. Gypsum works well for both interior and exterior applications. It is preferred as board finish plaster and hardwall plaster to cover drywall or plasterboard in interior walls and ceilings. Cement plaster. Cement is popularly used as an undercoat to create a hard background surface on brick or block layers. It can be applied manually or as spray finish plaster by using a plastering machine. Plasticiser is also added to cement plaster mixture to make spreading the plaster easier. There are some special types of plaster material that are used for specific applications. For example, magnetic plaster is used in kitchens, offices, and bedrooms to create a magnetic wall. Thistle Magnetic Plaster is an excellent multi-purpose alternative to hanging a magnetic board over your wall. The type of plaster materials, as well as the application process, will vary depending on the background surface where it will be applied. Certain factors such as the suction of the surface will have an effect on the adhesion of the plaster. For example, the higher the suction or water absorption capability of a surface, the better plaster will adhere to it. For surfaces that have low adhesion, it is recommended to spray liquid primer or water so that the plaster can adhere to the surface properly. Bonding agents can also be added to the plaster mixture as a solution to low adhesion. Another technique used to ensure that plaster adheres to corners and joints are plastering beads. Galvanized plaster beads are placed in joints, angles, and corners to act as reinforcement for the plaster and helps it adhere to the surface. 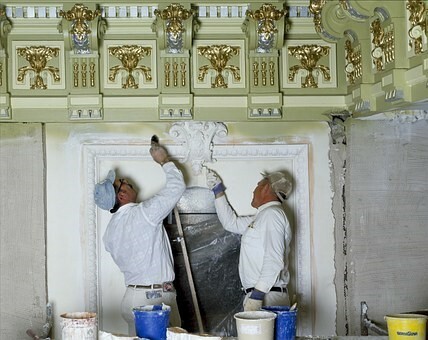 In some applications, it is often necessary to apply a thin layer of basecoat. Basecoat needs to dry properly first before the first layer of plaster is applied over it.